There are many reasons that people get rid of furniture. 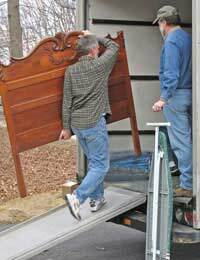 They may move home and the furniture no longer fits in with the décor of their new place. Or they may move to a home of a different size so their furniture is no longer the correct scale. Sometimes people just go off their furniture or it gets shabby and they’d prefer something new. Whatever the reason that you have unwanted furniture, there are plenty of things you can do to avoid having to throw it away. Before we go on to ways to re-use old furniture, it’s worth mentioning ways to cut down on furniture waste in the first place. It all goes back to what you buy. Ideally it would be good if you could buy mostly second-hand furniture, but that’s not always practical. However if you are interested in some second-hand furniture it's worth looking around charity shops and markets, and attending house clearances. You can often find unique and stylish furniture, or something that inspires you to do it up. If you’re just looking for furniture basics, you’ll find most things second-hand at a fraction of the price of brand new furniture. If you can’t get what you want second-hand, try and get the best quality furniture that your money will buy you. The higher quality furniture you get, the longer it will last and the longer it will be before you need to get rid of it. Similarly, try to get versatile furniture so that if you re-decorate the furniture will still fit in. Now, onto what to do with any old, unwanted furniture that you may have on your hands. Ask around and see if anyone wants your old furniture (if it’s still in good working order). If family or friends don’t need it it’s worth asking local organisations such as community projects and re-housing schemes. Try listing it through a site such as Freecycle too. Some charity shops also now have branches that deal exclusively in furniture. Many will collect furniture. There are now organisations which specialise in re-using furniture. They will accept and collect furniture and pass it on to those who can’t afford furniture of their own. The Furniture Re-use Network can direct you to an organisation in your area. You may be able to make a little money from your furniture. Try listing it in the local paper or on auction sites. Vintage furniture is fashionable these days, so if you have some original pieces you should be able to get a decent rate for it at auctions. Those looking for stylish pieces for their homes may be interested, as well as collectors and theatre and TV set designers. You may also be able to renovate old furniture and sell it on. You can really re-invent many pieces of furniture simply by painting them and re-upholstering. If you can’t give away or sell your furniture, it may be time to recycle it. Contact your Local Authority to find out if they collect furniture for recycling. Even if they don’t they will be able to tell you where your nearest furniture recycling centre is.